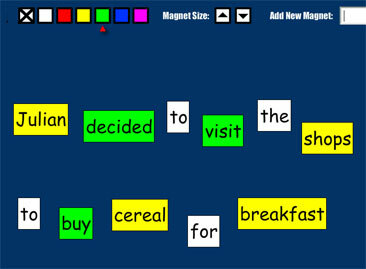 Russell Stannard, Winner of British Council Innovations Award 2010, writes about Word Magnets 2.0. I am always looking out for interesting tools that you can use with an interactive whiteboard. This latest find works great with an IWB but you can use it just as well on a computer screen or projector. The site is called Word Magnets and it is one of the best websites I have found in the last year. The idea of Word Magnets is quite simple. You write a sentence, a paragraph or just a selection of words. You then press a button and each of the words becomes an individual word magnet and they are randmomized at the bottom of the screen. You can then move the word magnets around the screen and they will “stick” anywhere and make a nice sound too, which really gives the feel that you are working with word magnets. The obvious thing is to write out a sentence, create word magnets of all the words and then get the students to re-build the sentence as class or in pairs or groups if you have lots of computers at your disposal. However you can do much much more with this tool. Word Magnets offers additional tools. For example you can colour the individual words. So you can get the students to colour all the verbs in red or all the nouns in yellow. You can get the students to re-build a sentence they have previously read and then get them to analyse the sentence and colour different parts of speech in different colours. It doesn’t have to be grammar you are analysing. After re-building the sentence you could ask the students to colour certain words if they have a particular meaning. For example the students could be asked to colour all the words describing character in a certain colour and then get them to discuss what each word means. As well as being able to colour the word magnets by simply choosing a colour and then clicking on the magnet, you can also delete them. This is a great tool. I currently learn Chinese and we have been using this tool to great affect. My teacher gets me to rebuild a sentence (we use Pinyin not Chinese characters) and then she asks me to read it aloud. She then deletes one word at a time (it is simple to do, you just click on the remove button and then click on a word magnet and it disappears) and asks me to say the sentence again. It gets harder and harder as she deletes more words and asks me to repeat the whole sentence. It is great for pronunciation and for syntax, which are both key in Chinese. You could easily do the same thing in English. You can use the remove button to get the students to remove certain parts of grammar or certain words (for example delete the word in the paragraph that means to be feeling low or depressed). The delete button has loads of uses. You can also create new magnets. Students can write a word in the box near the top of the screen and click on New and it will turn whatever word you write into a word magnet. Again this has loads of uses. For example, you can get the students to “build up” the sentence even more, taking it in turn to add additional words. Or you can get the students to substitute words. So they delete a word from the sentence and then add a similar word that can replace it. Amazingly, that’s not all. 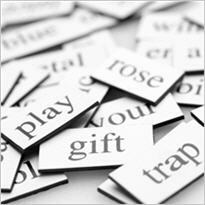 Word Magnets was created for language learning and so the tools it provides are thought out for that reason. You can choose a whole range of backgrounds, so for example you could you write a list of words like: always, never, sometimes, occasionally, often, frequently and then turn them into magnets. 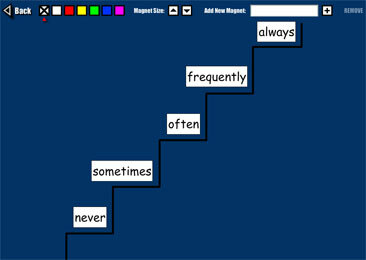 You can then choose a “step” background where the students have to put the words on the steps in order from the least frequent adverb to the most frequent. There are literally hundreds of backgrounds that the teacher can choose from and these open up an amazing range of possibilities. These Word Magnets training videos I have made will take you through all the different tools and what they do and will help you to really understand the potential of this tool. Word Magnets has been one of my best finds of 2010. It has really been well thought through and if you are lucky enough to use an IWB then it is even better fun though it still works well on a computer screen or project screen too. It really is worth looking into and I promise you that within 5 minutes of using it, you will be thinking of great ways to apply it with your students. See more of Russell Stannard‘s training videos on www.teachertrainingvideos.com. Follow Russell on Twitter: @russell1955. Categories: Multimedia & Digital, Professional Development | Tags: Advice, ELT, IWBs, Russell Stannard, Teacher Development, Technology, Web tools, Word Magnets | Permalink. What a great post! Thank you! I had seen Word Magnets before but had not realized all the ways students could use it for their learning. I’m really impressed. I’ll be using this very soon with my various ELT courses. Word Magnets is a great tool and I have used it successfully with many different students; even teenagers get completely involved. I don’t have an IWB but it works just as well if not better on individual computers in a computer lab. This way they can work individually, in pairs or small groups. I also like the delete function. In one activity, I ask students to randomly delete a certain number of words after having worked with the sentences in different ways. Then, they have to move to a different computer and add the missing words there.